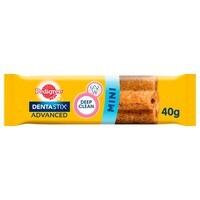 Pedigree Dentastix Advanced Small Dog Treats are longer lasting dental chews that can be given twice a week to smaller breed dogs weighing between 5 and 10kg. Scientifically proven to reduce the build-up of plaque at the gum line, where it matters most, the Dentastix Advanced treats have a revolutionary texture that flexes around your dogs’ teeth to give them a thorough and deep clean. Dentastix Advanced Treats are low in fat, have no added sugar, and are free from artificial colours and flavours.